Last Thursday I celebrated the Confirmations for 60 young men and women at Holy Name in West Roxbury. Last year I was supposed to have celebrated confirmations there but it coincided with the Holy Father’s visit to the United States. I was happy to be able to come back this year. It was a very fine group of young men and women. Msgr. George Carlson is doing a very good job in the parish and it is always a joy to be able to go and personally express our gratitude to the priests, the staff and the leadership in the parish for all that they do. 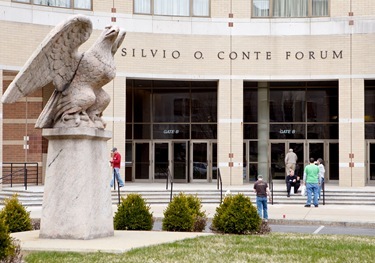 Holy Name is certainly one of the most beautiful parishes in the diocese, and it was from there that Cardinal Wright was buried many years ago. 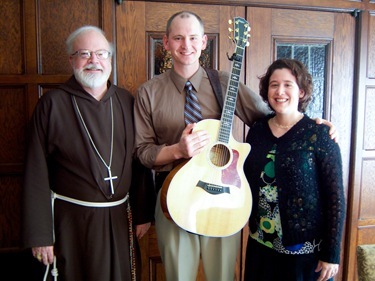 He is working in the Diocese of Harrisburg, Pennsylvania in the area of Evangelization but he has been very generous to come to this area often to help with events. 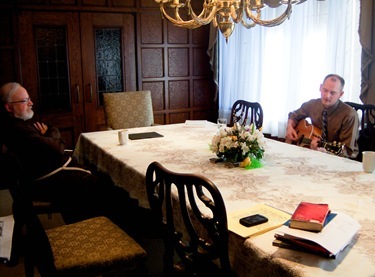 His musical gifts are a great asset to the Church’s ministry. 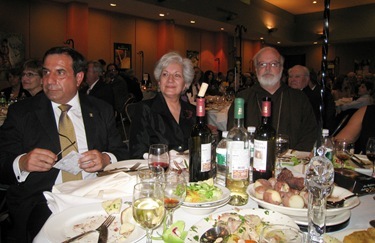 On Friday I was given an award from the Portuguese Consulate in Boston. 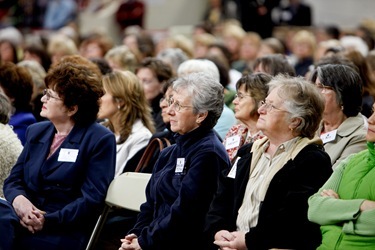 The event took place at St. Anthony’s in Cambridge and there were several hundred people there for the event. Every year the consulate honors three individuals, a Portuguese national, a Portuguese-American and an American for their dedication on behalf of the Portuguese immigrants in Boston. Of course, I was the recognized under the last category, and was very honored to receive the award. They gave me a beautiful crystal statue of St. Antonio de Lisboa, (also known as St. Anthony of Padua if you are not Portuguese!) 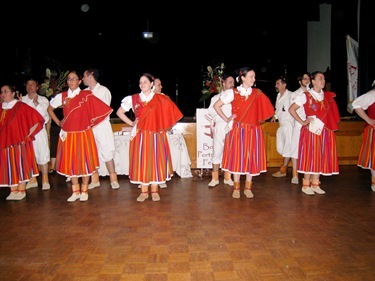 The focus of the evening this year was the island of Madeira and they had a wonderful Rancho Folclorico from Madeirenses living in New Bedford who danced and sang for us. The response was very good. 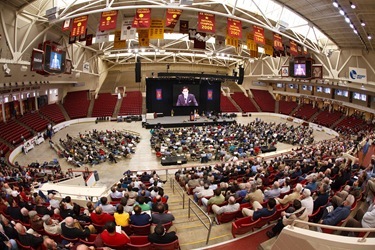 We had a couple thousand men on Saturday and maybe 2,500 women on Sunday who assembled in Boston College’s Conte Forum for the conferences. The speakers were excellent and were received with great enthusiasm. Many priests came to the events and heard confessions for hours on end. All of those who participated were very grateful to be there. There were many fathers and sons on Saturday and mothers and daughters on Sunday. 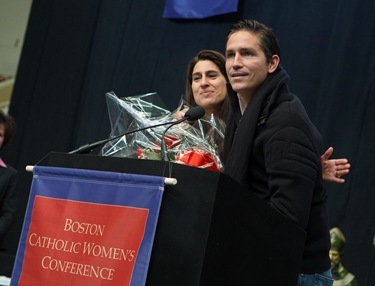 I was very pleased that we were able to initiate a new Catholic of the Year Award this year at the women’s conference, The Culture of Life Award. We honored Nellie Gray, who came up from Washington to receive the award. Nellie was a lawyer working for the government at the time the Roe vs. Wade decision was handed down in 1973. I think many Catholics were blindsided by the whole event, but she immediately gave up her job and dedicated herself to the March for Life. The first year, 1974, there were 20,000 people at the March and this year there were over 300,000. It has been one of the most important pro-life events in the country and it is consistently the largest annual demonstration in the city of Washington. The March for Life has been an opportunity to introduce many young people into the pro-life movement. I have gone to every March since Nellie started them over three decades ago. At the conference, I told Nellie that some of the Latin American students that went with me to the early marches later went back to their countries and became pro-life leaders there.They later told me that their inspiration came from her and the pro-life march. So we were very pleased that she was able to come and address the crowd. 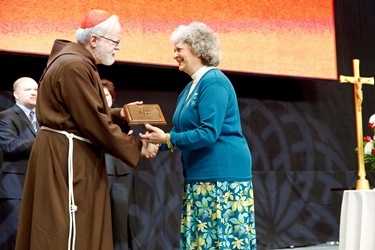 The other awardees were Sister Marian Batho, who received the Religious Sister of the Year award and recognized for her work as the Delegate for Religious and Loretta Gallagher, who was recognized with the Laywoman of the Year Award for her extensive work both at the parish and archdiocesan levels. Awards were given at the men’s conference as well. 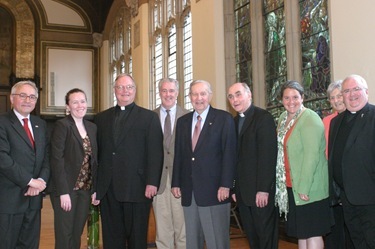 Father Rodney Copp of St. Charles Borromeo Parish in Waltham was presented with the Priest of the Year Award; Deacon Leo Donoghue, former director of the Permanent Diaconate Office for the archdiocese was given the Deacon/Religious of the Year Award; and Steve Guillotte, a Knight of Columbus from St. Anthony of Padua Parish in New Bedford, received the Laymen of the Year Award. 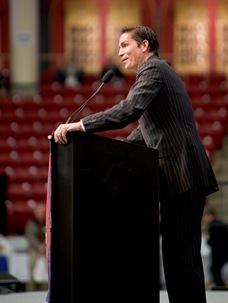 I was grateful that Jim Caviezel was able to return for the men’s conference this year. He spoke very eloquently. 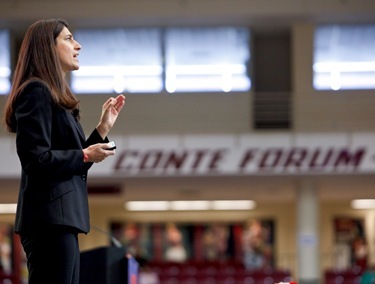 Also, I had not heard his wife speak before but I was very impressed by the talk that she gave at the women’s conference on marriage and family life in today’s world. The Greek Orthodox and the Catholics of the Eastern-Rite follow the Julian Calendar so their feast days don’t necessarily coincide with ours. This year their Easter was a week after ours, so on Saturday night they had their Easter Vigil. Father Jonathan and I went as we do every year. They invited me to read the Gospel and to address the people, to bring Easter greetings from the Catholic community to them. It is always a very moving event, much like our own Easter Vigil. They repeat that song over and over again as they are blessed with the candles. You see people leaving the Greek cathedral with the flames that they take home and use to light oil lamps in front of their icons with the paschal flame. They gave us two Easter baskets with red eggs, which is a very Greek custom. We got back to the cathedral around 12:30 a.m. for the ending of the Easter Vigil for our Geez community – the Ethiopian community which meets regularly at the cathedral. I was able to wish them a happy Easter and to bless the food for their Easter meal that began around 1 o’clock in the morning. This year I regretted very much having to miss the annual Knights of Columbus Lantern Award ceremony but the nuncio had invited me to partake in a celebration of the Holy Father’s anniversary in Washington. I went down for the day and there was a very lovely celebration at the Apostolic Nunciature and it was an opportunity to connect with many of the bishops and Catholic leaders throughout the nation who were gathered for this event. 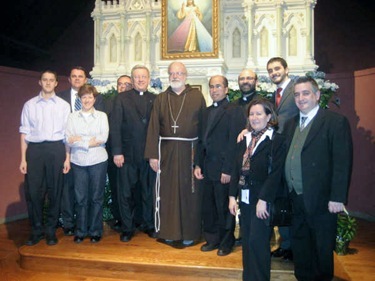 The next morning, I celebrated the Mass of Saint Conrad of Parzham for the Capuchin community in Washington. Saint Conrad is the only saint from my province, and we hope not the last one! He was a German lay-brother at the famous Marian shrine of Altoetting in Germany — a place the Holy Father visited in his last trip to Germany. The Holy Father was actually born right near that monastery and has always had a great devotion to Our Lady of Altoetting and “Bruder” (brother in German) Conrad so I was happy to be able to celebrate that. Tuesday evening I was invited to BC to attend the book launch of “Two Centuries of Faith,” a historical project celebrating our diocese’s bicentennial. 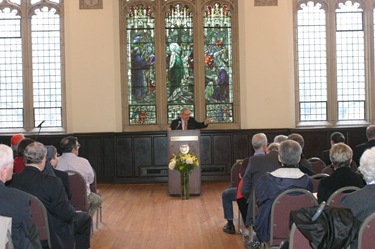 The book’s editor, Tom O’Connor, gave an address on the genesis of the project and spoke about the essays included in the book. 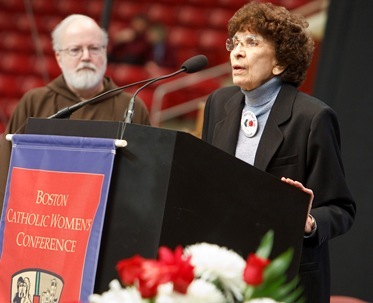 The book focuses on the influence of our Catholic Church on Boston over the past two hundred years. 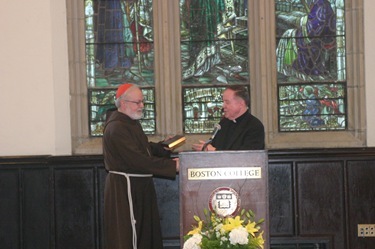 Afterwards, Father Leahy gave me a copy of the book—a special deluxe version! I am so pleased at how the book turned out and know that it will be a very valuable resource for many years to come. I understand that a movie based on Brown’s book Angels and Demons is about to premier. Portions of the plot take place in my titular church in Rome. I read the book a few years ago and I didn’t find it a great piece of literature. The ending is a kind of a “deus ex machina” and, although it does not present a favorable picture of the Church, in my recollection is not as damaging as The Da Vinci Code, which calls into question the basic tenets of Christianity — Jesus’ divinity and the divine origins of the Church. I understand that “The Da Vinci Code” was not a successful movie and this one will probably not be very successful either, but Dan Brown’s books were very profitable. But “The Da Vinci Code” was a particularly virulent attack on the Church filled with many untruths that underscores the need for our Catholics to be more informed about their faith and the history of the Church. I always joked that I wanted to bring that statue back to Boston, but the Carmelite friars who run my church told me that Napoleon tried to take it to Paris and not even he was able to. They also tell me that they get a lot of tourists coming to the church because it is on the Angels and Demons tour of Rome. But, apparently, the director of the film was refused admission into the Church (although I’m sure they will still do something to replicate it in the film). Wednesday, I visited with Bishop Musie Ghebreghiorghis, O.F.M. Cap. He is the bishop of a relatively new diocese in Ethiopia. There are 10 dioceses in Ethiopia and three of them are led by Capuchin bishops. The Capuchins have been very involved in the history of the Church in Ethiopia because it was a Capuchin missionary, Cardinal Massaia, who in the 1800’s reintroduced the Catholic Church into Ethiopia. Cardinal Massaia was a missionary there for almost 40 years and wrote a several volume history of Ethiopia, which has been very important to understanding the history of the country. He was also, along with other missionaries, responsible for writing down the native language and translating the bible into their native language. 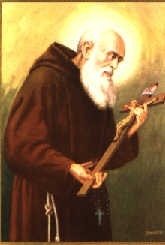 His cause of beatification has been introduced; he is certainly one of the great Capuchin missionaries from Italy. 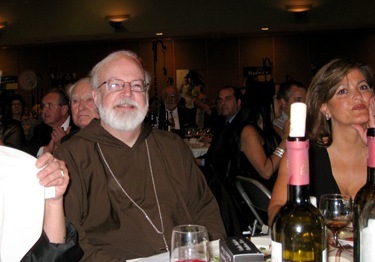 The first friars who went there were Italian, but now we have a province of friars in Eritrea, which was the first province of Capuchins in Africa, and another province in Ethiopia. 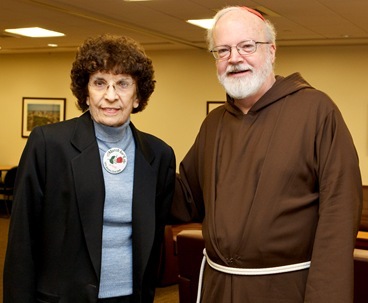 The bishop was here as part of the 800th anniversary of the Franciscan order and he gave a lecture at St. Bonaventure’s University in New York. 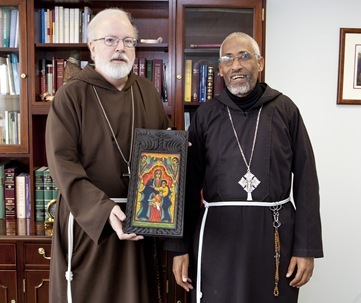 While he was in the country he wanted to visit Archbishop Chaput and myself, the two Capuchin bishops in the U.S. We were very pleased to have him celebrate Mass for our own Ethiopian community in Boston and he brought me a beautiful Ethiopian icon of Our Lady. 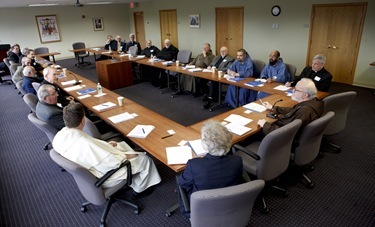 In the afternoon I had a meeting with the major superiors of communities of men that are present in the archdiocese. 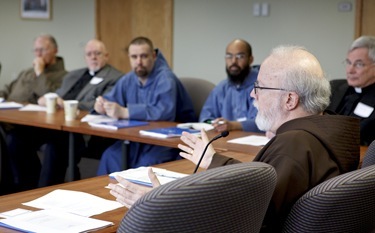 Some of them were visiting the Pastoral Center for the first time and they were pleased to see it. It was an opportunity for information sharing and updates on what is happening in the diocese as well as an opportunity for the religious communities to share with each other what is going on within their own individual ministries. 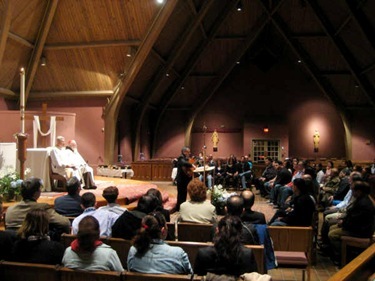 In the evening, Fathers George Szal and Carlos Flor invited me to preside over a Liturgy of the Word at Immaculate Conception in Revere where a team of catechists of the Neocatechumenal Way have been catechizing for two months. 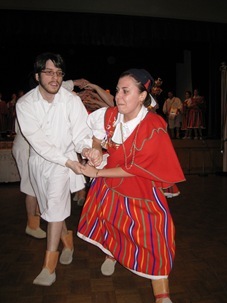 There were about 40 people who had gone through the program. 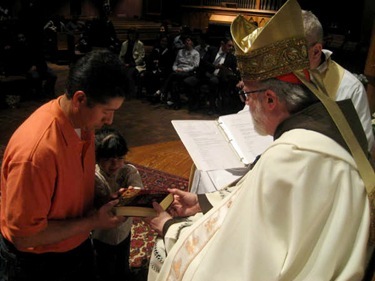 Towards the end, the people came to receive the bibles that they will be using as they begin their formation in a neocatechumenal community. There was great enthusiasm among the people and, even though the catecheses were given in English, quite a number of Hispanics were there. Father George and Father Carlos are doing a wonderful job in Revere and the parishioners are very pleased with what has been happening in the parish.